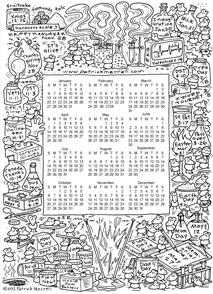 The illustrated Mus musculus calendar is back by sufficient demand, this year with a science theme. Download a pdf in the size of your choice, or avoid future regret and download both. Find “July 4” in the drawing. This entry was posted on Monday, December 31st, 2012 at 6:18 am and is filed under Calendar, Gadzooks!. You can follow any responses to this entry through the RSS 2.0 feed. You can leave a response, or trackback from your own site.